There are a lot of times when a fully waterproof shell is far more than you need. Rather than carry around all that Gore-Tex-ified bulk and weight, you may want to consider cutting your pack weight significantly by going with something as simple (and lightweight) as a basic water resistant shell. Sure, a water resistant shell won't keep you dry in torrential rain, but it does just as well in situations where you're simply trying to block the wind, deal with a light drizzle, or weather a brief downpour. Plus they breathe way better than even the most breathable waterproof garment (which can cause you to get soaking wet from sweat and condensation inside). And if you are caught in a prolonged deluge, even wet or damp fleece layers will still provide warmth—just make sure you have dry layers safely stowed in your pack! Finally, it's important to realize that these ultralight shells are wisp thin (many are made with ultrafine 15-denier thread) and not designed for abrasion resistance. Not the best choice for bushwhacking or other high abrasion activities. Weight-wise, however, they can't be beat. Even the lightest weight waterproof breathable jackets tip the scale at somewhere between 8-12 ounces, with most Gore-Tex (or equivalent) jackets weighing well over a pound. Add in a pair of waterproof rain pants, and you can easily be carrying 2 pounds of rain gear. In contrast, you can buy an ultralight water resistant shell that weighs four ounces or less and packs down to the size of a plum. 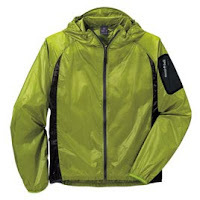 GoLite Ether Wind Jacket A full-zip jacket with hood that's made from 88 percent recycled polyester (4.1 ounces; $80). Add their Whim Pants to complete the outfit (4 ounces; $50). Montbell U.L. Wind Parka Full-zip hooded jacket with a shoulder pocket and reflective strips (3.3 ounces; $79). Add their 2.4-ounce U.L. Wind Pants for full coverage ($66). Wild Things Superlight Windshirt and Pants A half-zip, unhooded jacket (2.4 ounces; $90) and pants (4 ounces, $90) made from silnylon. The cuff-to-knee zipper on the pants is a nice feature. 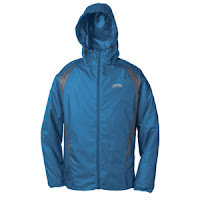 Arcteryx Squamish Pullover A three-quarter hooded jacket and the heaviest of the lot. The velcro closures around the wrist are a nice bonus with this one, however (5.3 ounces, $139).